Interested in starting your own family tree? I’ve put together this video guide to show you how to get going. You can use the birth, marriage, death and census records I mention in the video by signing up for Findmypast’s 14 day free trial. You’ll need to enter payment details, but just cancel the day before the expiry date through the ‘My Account’ section of the website and you won’t be charged. I’ve been tracing my own family history for about six years – my paternal Silk ancestors feature in the video. I really hope you find it useful. Earlier this year, I mentioned that there’s a family rumour about the father of my paternal great-great-grandmother, Maria Taylor. My nan believes that Maria’s father once won a rowing race called the Doggett’s Coat and Badge. What was the Doggett’s Coat and Badge? world. It was set up and funded by the comedian Thomas Doggett and has been held on the River Thames since 1715. Unbelievably, it’s still going today! Every year, six Thames Watermen who had recently completed their apprenticeships raced from The Old Swan pub at London Bridge to The New Swan pub at Chelsea. Watermen appear to have been similar to taxi drivers, rowing passengers along and across the river. The prize was an orange coat, a silver badge and the winner also apparently became a Royal Waterman. This ties in nicely with another family rumour about Maria Taylor’s father – that he once took Queen Victoria across the River Thames. I was introduced to Maria Taylor’s father for the first time on her marriage certificate. My nan has a copy of this in her possession, so I didn’t need to order it from the General Register Office. The marriage certificate shows that Maria married my great-great-grandfather George Jones at Putney Church on Christmas Day in 1899. My nan believes it wasn’t unusual for people to get married on Christmas Day, as it was often one of the only days they had off of work. Thomas Edward Taylor is recorded as being Maria’s father – my great-great-great-grandfather. According to the certificate, he was employed as a Lighterman. Lightermen were similar to Watermen, transporting goods across the River Thames, so this occupation fits in with the family rumour. My initial investigations seem to show that there could be some truth behind my family rumour. Thomas Edward Taylor had the right sort of occupation to have won the Doggett’s Coat and Badge race. My next challenge is to see whether any records about the race and the Watermen who took part in it survive. One of the first pieces of advice I was given when I started researching my family history was to ask family members for photocopies of any original documents they may have, such as original birth, marriage and death certificates. This week I realised that this doesn’t just save money when it comes to ordering copies of certificates from the General Register Office (GRO), but also that the originals can teach me something I would never have learnt from the GRO copies. Following a bit of google research and this handy article on Sue Adams’ Family Folklore blog, I now know that these are actually examples of revenue stamps which were used to pay stamp duty, a tax on documents. Although I was already aware of stamp duty, I didn’t realise that it had been paid with a physical stamp in the past. Had I not asked my family for copies of these original certificates, I may never have discovered this as the GRO copies don’t include this detail. Sue Adams’ article states that these ‘Postage and Revenue’ stamps were introduced in 1881, though stamp duty had been imposed on the registration of births, marriages and deaths from 1783. What I have yet to establish is when the practice of attaching a stamp to certificates died out. The latest example I have in my possession is from 1948. I’d be interested to hear from anyone who has a later example or knows the date this practice stopped. With the London 2012 Olympics just around the corner, it seemed a fitting time to learn about the Olympic connection in my family tree. 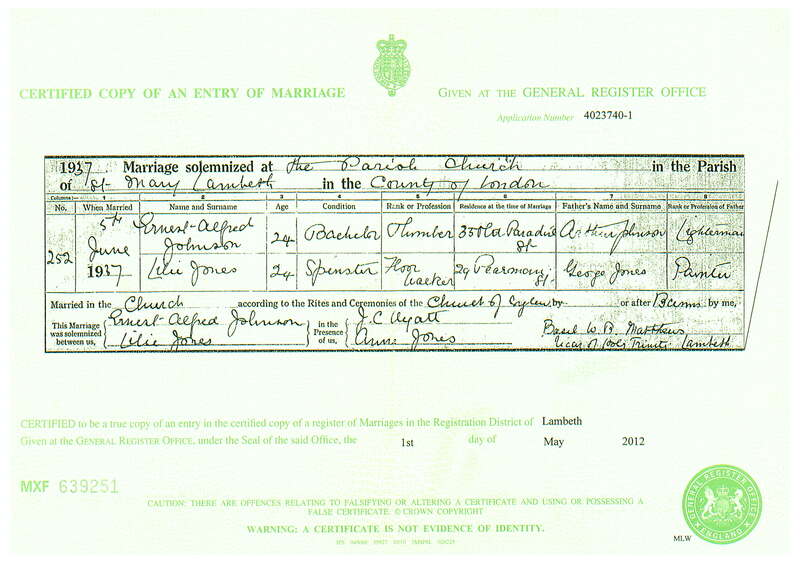 A quick search of the marriage records at findmypast.co.uk told me that Lilie and Ernest married in Lambeth, London in the June quarter of 1937. I used this information to order a copy of their marriage certificate from the General Register Office. 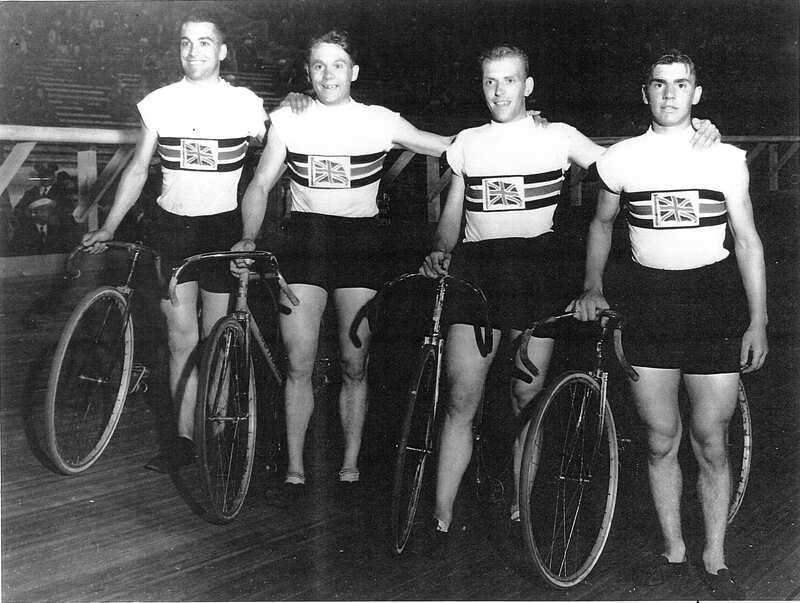 My nan was able to confirm that Ernest competed at the Los Angeles and Berlin Olympic Games in 1932 and 1936 as part of Great Britain’s team pursuit cycling team. Amazingly, he won a bronze medal at both! My nan also produced this incredible photo of Ernest and the rest of the team – she believes it was taken at the 1932 Olympics in Los Angeles. Ernest Johnson is on the far right. Although it’s nothing compared to Ernest’s incredible achievement, I’m very lucky to have my own Olympic connection this year. I’m currently rehearsing hard as I’ll be taking part in the London 2012 Olympic opening and closing ceremonies in just a few weeks’ time. It’s going to be an amazing experience and will now feel even more special because I know that my great-great-uncle would have been one of the athletes parading around the stadium 80 years ago. A first wife, an unknown father and yet more questions! Firstly, Sophia Stevens has no father listed. This is the first time I’ve come across an ancestor with an unknown father – I imagine it may be difficult to track her ancestral line further back, but I’m keen to have a go! Interestingly, it seems Sophia was literate as she has signed her name at the bottom of the certificate, while Richard has made a mark. 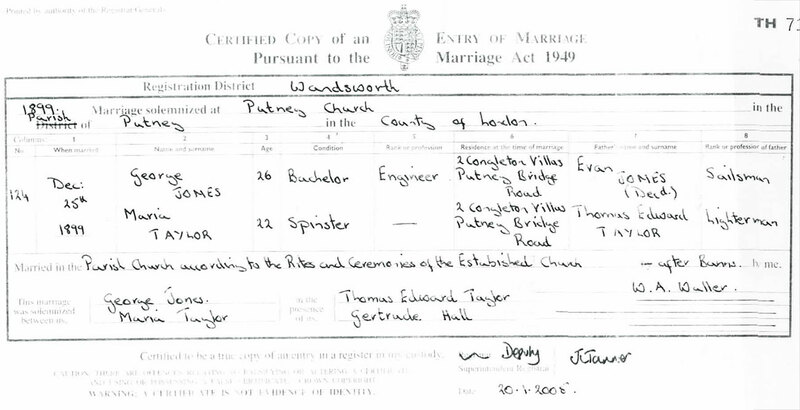 Initially, I thought Richard’s father was recorded as ‘Janus Howard’ on the far right of the certificate. However, I’ve been unable to find any Janus Howards in any census so I suspect that part of the writing may be missing, making the name look different. Take a look at the image I’ve doctored below – if a line is added between what I originally thought was an ‘n’ and a ‘u’, the name looks like it should be James Howard. Finally, the marriage certificate revealed that Richard was a widower when he married Sophia. This is very useful information and has helped me find Richard Howard in the 1861 census. 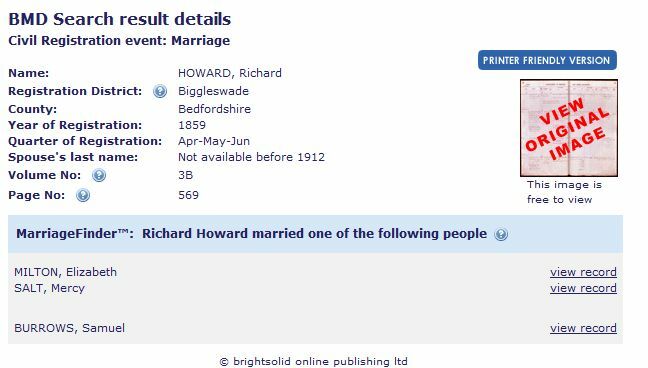 Here, Richard is listed with a different wife (Mary Howard) and two children with a different surname (Salt) living in Biggleswade, Bedfordshire. Now that I know Richard was a widower when he married Sophia in 1875, I could presume that Mary was his first wife and that perhaps her surname had been Salt. I was quite touched when I discovered that Richard’s first wife was called Mercy. My great-great-grandmother (Richard’s daughter by his second wife) was also given this name, a lovely tribute to his first wife. 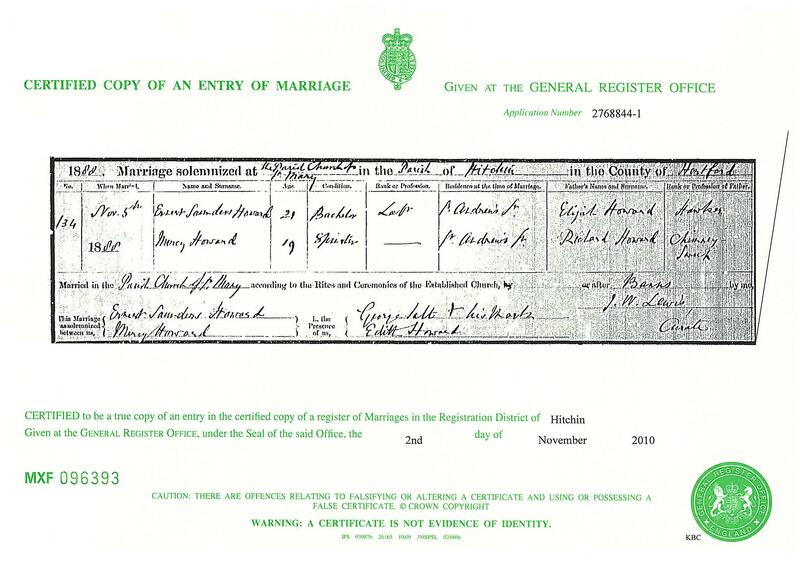 After my post last week, I immediately looked for the record of Ernest and Mercy Howard’s marriage in findmypast.co.uk’s BMD records and then ordered the certificate from the General Register Office. This has just arrived and I thought I’d put it straight up here as it would have been my great-great-grandparents’ wedding anniversary today! The certificate tells me that 122 years ago today, Ernest Saunders Howard married Mercy Howard in the Parish Church of St Mary in Hitchin, Hertfordshire. At that point Ernest was a Labourer, but it seems pretty obvious how he later got into Chimney Sweeping as his new father-in-law, Richard Howard was recorded with that occupation. The certificate also reveals the name and occupation of Ernest’s father – Elijah Howard, a Hawker. I wasn’t sure what a Hawker was so I looked this up in a book I bought at the Who Do You Think You Are? LIVE show I attended in February. It’s a pretty good little book, I’d definitely recommend buying it as a handy reference tool. It’s called Old Occupations and Descriptions and is written by Eve McLaughlin. In it, a Hawker is described as an ‘itinerant seller of small goods carried in pack (licensed)’ – a travelling salesman, it seems! 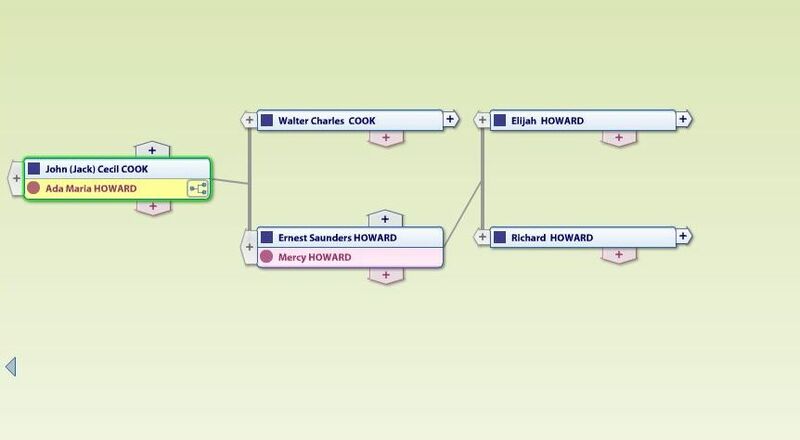 I’ve added all of this extra information to my family tree, including the names of my great-great-great-grandfathers, Richard Howard and Elijah Howard. I’m surprised at how easy it’s been to get my family tree back to this generation! One of the new pieces of information that the certificate has revealed is the rather odd middle name of my great-great-grandfather – Ernest Saunders Howard. I wonder whether this was his mother’s maiden name? Something to look into! 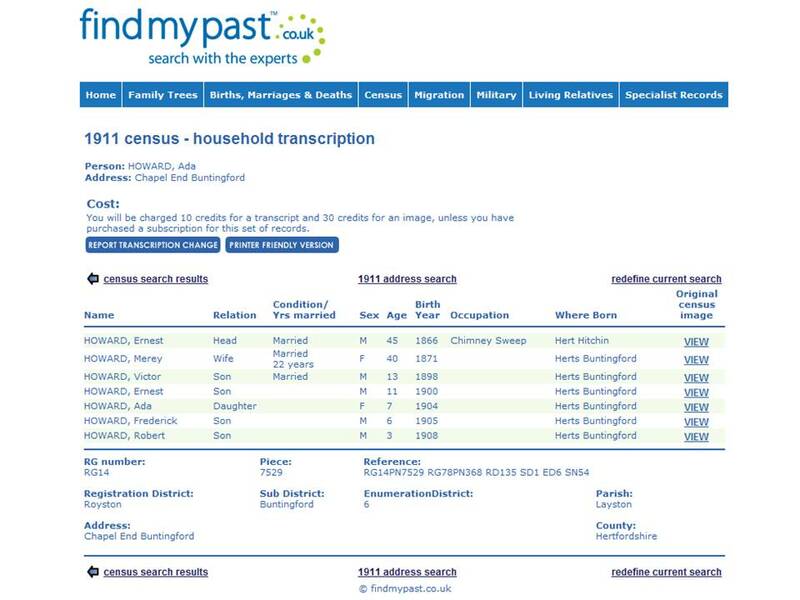 Over the past couple of weeks, I’ve been working on a project to show family history newbies exactly how you can start researching your family tree with findmypast.co.uk. I’ve used an example from my own ancestry – my paternal Silk line – and have actually managed to trace my tree back to about 1794 using these 10 steps. To take a look at my progress, simply click on the image below and a powerpoint presentation will start downloading. If you then select ‘notes page’ in the ‘view’ section of the tool bar at the top of the screen, you’ll be able to see my notes along with the images on the presentation itself. Alternatively, if you wanted to print the presentation, simply select ‘notes pages’ in the drop down box under ‘print what’ and it will print both my notes and the images. I hope you find it interesting – let me know what you think! Now that I know my great-grandparents were alive, I can search to see if I can find them in the recently released 1911 census. I’ll take my great-grandmother Ada Maria Howard as an example to demonstrate how to find an ancestor. I’ve selected the 1911 person search from findmypast’s census collection and have entered basic information to begin with, following the findmypast rule of thumb of ‘less is more’. I’ve entered Ada in the first name field (leaving the variants box ticked so that the search includes nicknames, middle names and initials) and Howard in the surname field. 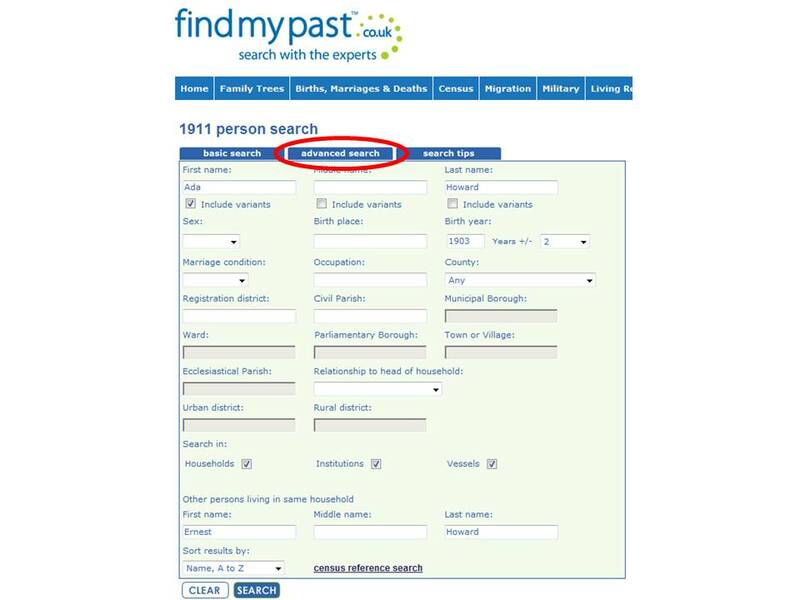 This search returned 314 results, meaning there were 314 Ada Howards living in England and Wales in 1911. Fortunately, I have a bit more information about my great-grandmother courtesy of her marriage certificate (featured in the post below) so was able to narrow these results down a bit. I selected ‘redefine current search’ and added a birth year to the search terms. Ada was recorded as being 23 years old at the time of her marriage in 1926, so I’ve entered 1903 as the birth year. The search defaults to include births two years either side of 1903, a really handy tactic to avoid any age inaccuracies in the census. It’s not unusual to see a year or two shaved off of or added to ancestors’ ages in census returns – be it down to vanity, an attempt to conceal an illegitimate child or even simply that the head of household couldn’t recall the exact ages of his/her children. By adding this rough date of birth, I managed to narrow the list of results down to just 27 possibilities. However, Ada’s marriage certificate had provided me with another handy bit of information – her father’s name, Ernest. So I selected ‘redefine current search’ again and then switched to ‘advanced search’ via the tabs at the top of the search screen (see below). Here I entered ‘Ernest Howard’ in the ‘other persons living in the same household’ search field. This time, my search returned just three results. One of these, the top result in the image below, looked like a clear winner as this Ada Howard was living in Hertfordshire in 1911 – the same county my great-grandmother was married in 15 years later. 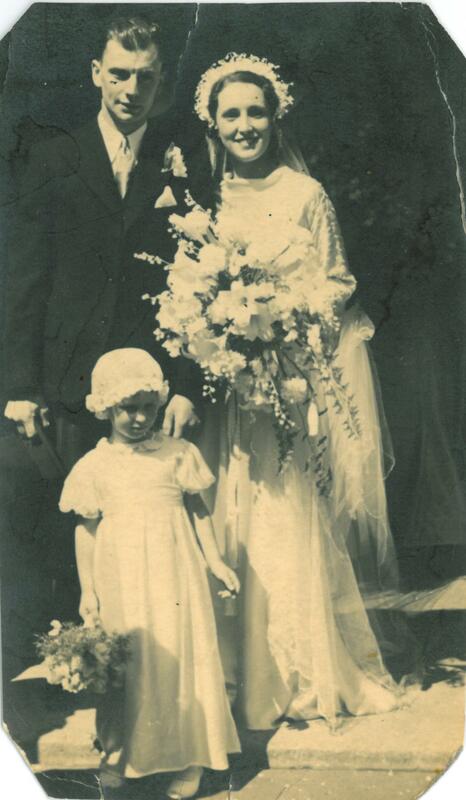 In addition, the marriage certificate had informed me that Ada’s middle name was Maria – not matching the middle names of either of the other two search results. To confirm that this was indeed the right Ada, I viewed the transcript – a typewritten version of the original census page. You can see that the transcript showed me exactly what I had hoped it would; Ada Howard living as the daughter of Ernest Howard, a Chimney Sweep. If you look at the bottom of the transcript, you can also see that the address the family were living at in 1911 exactly matches that recorded on my great-grandmother’s marriage certificate – Chapel End, Buntingford. I then decided to view the original census image. The 1911 census is the first from which original householder schedules have survived – the other surviving censuses from 1841 to 1901 consist of the census enumerators’ summary books. 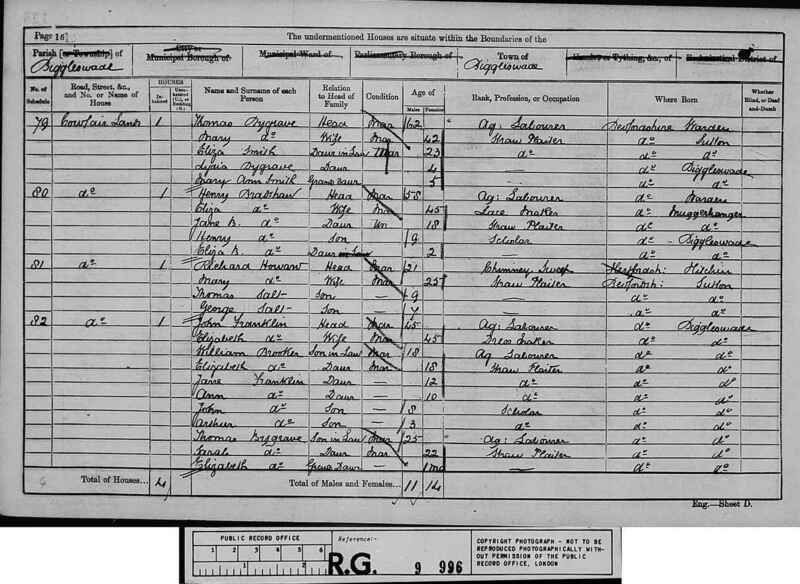 This means that the 1911 census return you can see above was actually completed by my great-great-grandfather Ernest Howard – you can see his signature at the bottom right of the page. Next to Ernest’s signature, we are also told exactly how many rooms (rooms, not bedrooms!) their home had. In the Howard family’s case, there were seven people living in just four rooms. The 1911 census return has also provided me with brand new information about Ada’s mother, my great-great-grandmother. Her name is a bit tricky to read on the census return, however it has been recorded as ‘Merey’ in the transcript. The census form also informs me that she was 40 years old in 1911 and had been married to 45-year-old Ernest for 22 years. These handy bits of information will enable me to search the BMD indexes once again, this time for my great-great-grandparents’ marriage and births. In addition, if I look over to the right of the census form, I can actually see where Ernest and Merey were both born. My 1911 search has provided one final bit of rather shocking information. In 1911, my great-great-grandmother had given birth to an impressive 12 children but sadly only half of these had survived. The number six has been listed in the census form’s ninth column, recording the number of ‘children who have died’. The 1911 census return has provided me with a lot of new information about my family, however the most striking point is just how precarious my great-grandmother’s existence must have been! The marriage certificates I ordered from the General Register Office have provided me with lots of juicy new information about my great-grandparents. Below you’ll find a quick overview of the details that marriage certificates can give you. I’ve added this new information to my family tree, extending it back a generation to include my four newly discovered great-great-grandfathers. I really feel like I’m making some progress! Now that I have an idea of my great-grandparents’ ages at marriage, I can have a root around for the records of their births in the BMD indexes. In addition, because all four seem to have been born before 1911 and because I now know their fathers’ names and occupations, I could attempt to search for my ancestors in the recently released 1911 census – currently the closest census to the modern day available. Aside from this, I’d really like to find out a bit more about what my great-grandparents’ and great-great-grandfathers’ occupations entailed. In particular, I’d love to find out more about Jack Cooke’s employment as a Chauffeur, Ada Howard’s life as a Domestic Servant and what her father’s day would have been like working as a Chimney Sweep. If anyone has any suggestions as to how I might be able to find out a little more, please do point me in the right direction. 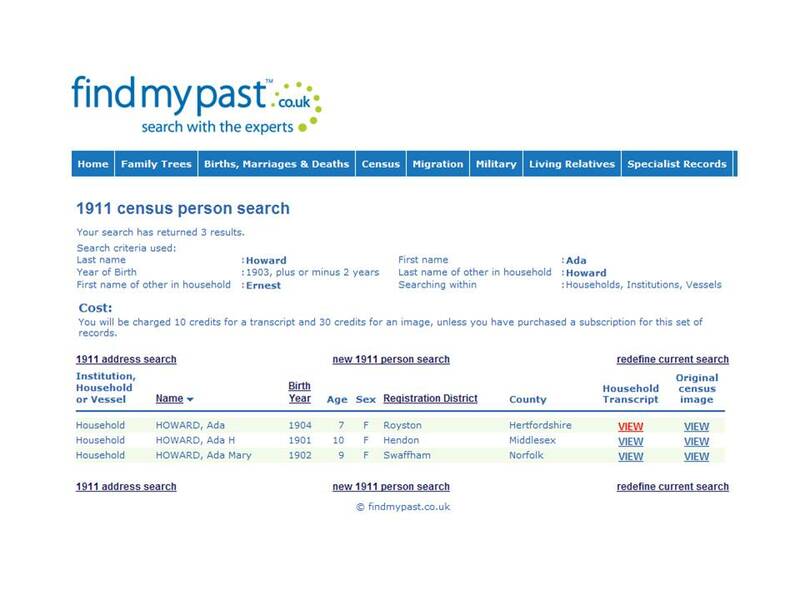 I’ve decided to start filling in the blanks in the maternal side of my family tree – namely the dates of birth, marriage and death for all four maternal great-grandparents – by locating the marriages in the indexes on findmypast.co.uk. I’m starting with my great-grandparents’ marriages because while she was unable to provide me with these dates, my mum did tell me when my grandparents were born and also roughly when their elder siblings were. By using this information, I can make a couple of educated guesses as to the likely years of marriage, making my search a lot easier. While my search covered 10 years, I decided to start viewing the records from the year I would initially expect to see George and Lucy getting married, namely the year preceding their eldest’s birth (the end of 1924 – the end of 1925). This turned out to be a masterstroke as I quickly spotted a likely looking marriage in the first quarter of 1925; the index shows that a George W. Mead was married to a woman with the surname Wright in West Ham. Feeling like a detective, I returned to the marriage index search screen to check that the Ms Wright was indeed a Lucy. This second search, for Lucy Wright in the first quarter of 1925, resulted in further success as I spotted a Lucy M. Wright marrying a Mead – also in West Ham! The GRO reference (the code at the right of the record) for both George and Lucy’s entries also matched, reassuring me that the entries relate to the same marriage. 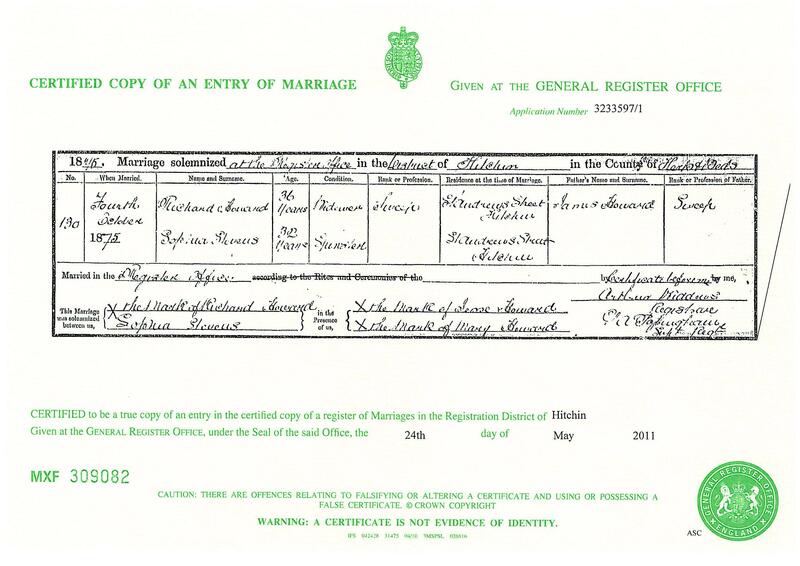 Now confident that these records refer to my great-grandparents’ marriage, I have ordered my first ever certificate from the General Register Office. This was surprisingly simple to do as you can now order BMD certificates online through the GRO website, www.gro.gov.uk. One tip: make sure you record the GRO reference provided in the indexes at findmypast.co.uk as you’ll need these numbers when ordering the certificate. The first part of the reference provided refers to the volume number (in George and Lucy’s case, this is 4a), while the second section is the page number (175 in this example). Using the same tactics, I’ve also managed to locate the marriage of my other set of maternal great-grandparents and have ordered their marriage certificate too. The certificates cost me £7 each and should be with me in about a week – I can’t wait!